UPDATE (12/11): Cool effect addition: the clock now chimes and the bells animate on the hour! You'll find two versions on the zip, the new one with sound, and I left the old one for those who prefer it silent. 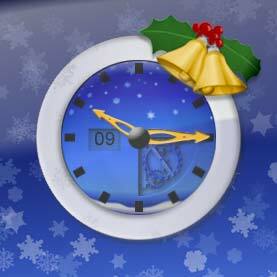 Travis Thompson's Imagine Clock that I've modified to match Paul Boyer's Christmas Time theme. Thanks to both authors, and to Stardock for letting me share this object with you. Permissions are included in the zip file. This is a great clock paxx! I like it so much that is why I was wondering if you could (only if time permits)make one w/o the bells. I want to keep this clock for all times and for all seasons nad not just for Christmas...Thanks! Does the "hour hand" only move on the hour? So there is no way of realing knowing what time it is by looking at the clock. What do you mean. The Minute hand is always at the correct minute, and the Hour hand is at the right hour. In a way it makes more since then normal analoque clocks. You'll get used to it after a little bit. Travis, I understand your point. It will take some time getting used to a new way of looking at analog clocks. it took me a while after I made the original. very nice, looks great with morg's christmas set. ohhhhhh the chimes just went off. wow. Comments about the new chime feature would be appreciated. It is cool? Is it annoying? It makes the download much larger, so is it worth it? That download is still tiny to me, but then I'm on 3300/256 cable so it took a little over 2 seconds. Cool new version Great work.